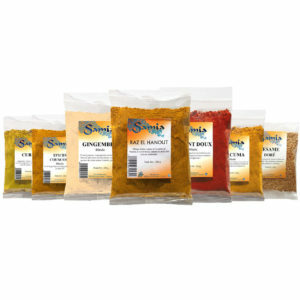 We offer a wide range of spices, most of them are available in the following formats : 100, 250 and 500g. Don’t hesitate to contact us to know the whole range. 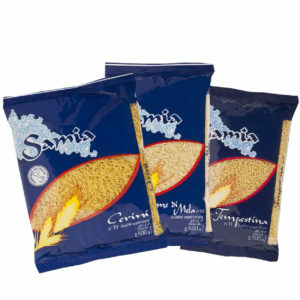 SAMIA pastas are made from wheat semolina of high quality. 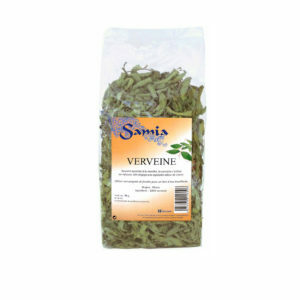 We offer many varieties : tempestina, piombi, grana di riso, seme di mela, cerini, etc. Whole blanched almonds : unshelled almonds, or peeled almonds. 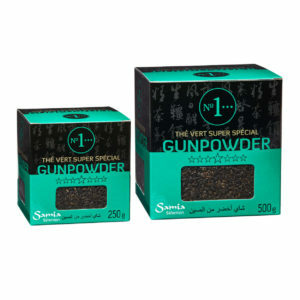 Often used in salted preparations (tagine, couscous), it can also be consumed as it is as a snack. Blanched diced almonds : diced almonds or crushed almonds are used in several oriental recipes, both sweet (pastries) and salted (pastilla). Blanched Sliced Almonds : peeled almonds cut in thin slices. 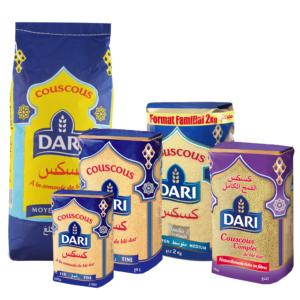 They are used as a topping in salted preparations (fish, chicken, couscous, tagine). 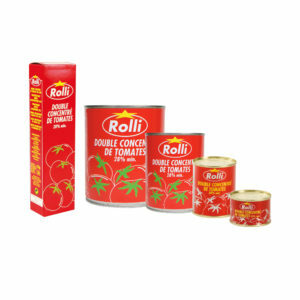 Also used in pastries or as a decoration for some meals. 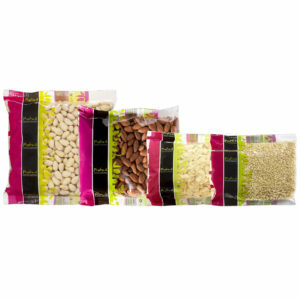 Most of our almonds are in 250g, 400g, 800g and 1kg. 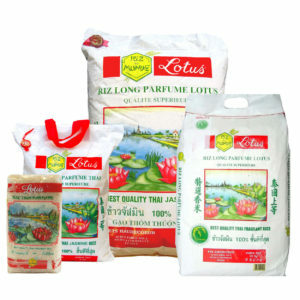 Do not hesitate to contact us to know the whole range. Chickpeas : is a round pea ending in a point. It is very perfumed and keeps its shape during the cooking process. We offer several sizes. 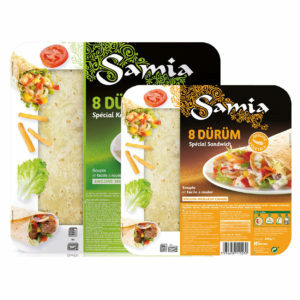 Discover our Halal Sauces SAMIA and find the best taste for your kebab. 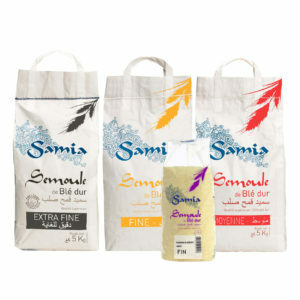 Created 30 years ago, Jumbo is now an essential reference to African cuisine. 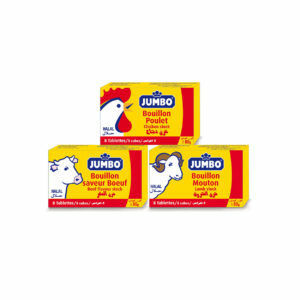 Declined in cubes and powder, Jumbo stocks are used in many culinary preparations. One spoon of powder = one cube. 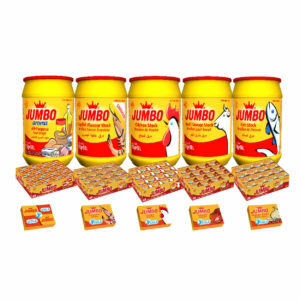 Haudecoeur is the EXCLUSIVE DISTRIBUTOR of Jumbo in France. Peanut butter DAKATINE 4/4 and 1/2. Is obtained by the milling of selected peanuts. Those peanuts were entirely peeled and roasted before being thinly milled. It can be consumed as it is or mixed with sugar or honey. 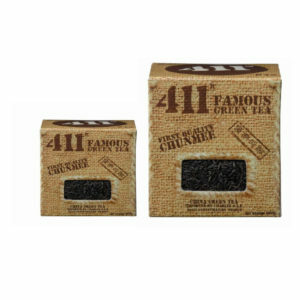 It will perfectly go along any traditional African or Asian meals. 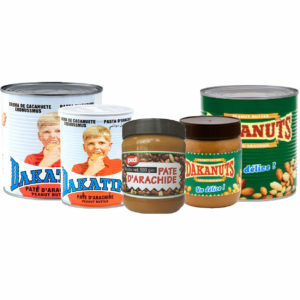 Peanut butter DAKANUTS 4/4 and plastic jar 500g. Same as Dakatine but more competitive. One of the most ancient peanut butter in Europe. Contains more than 96% of peanuts. 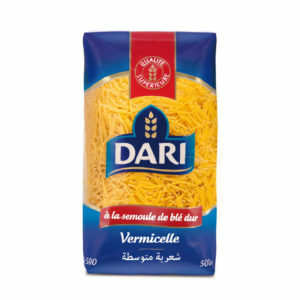 Durum, which means “winding” in Turkish, is a thin bread that we filled with meat, vegetables, spices, onions, sauces, etc. Diameter 30 cm, easy to roll. Roasted and salted blanched peanuts : eat as a snack, also used in Asian and African cuisine. Roasted and shelled peanuts : often used in Asian cuisine, fried in wok to add flavor to vegetables or chicken but also crushed in butter in order to make sauces. 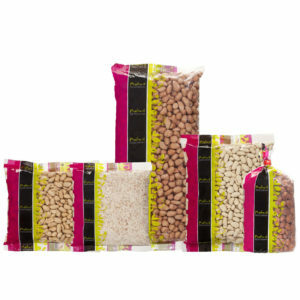 Most of our peanuts are in 500g, 1, 5 and 25kg. Do not hesitate to contact us to know the whole range. 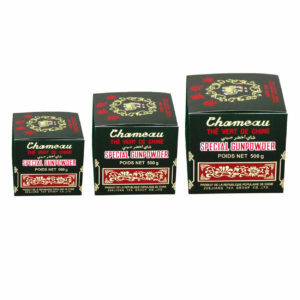 Orange blossom’s aroma 0.5 L and 1 L : perfume most of the oriental pastries. 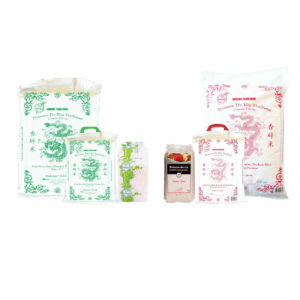 It can also be used in candies, ice creams and pastry dough. Rose’s aroma 0.5 L: from roses petals’ distillation and with a strong perfume, the rose’s aroma is perfect for pastry dough and ice creams. 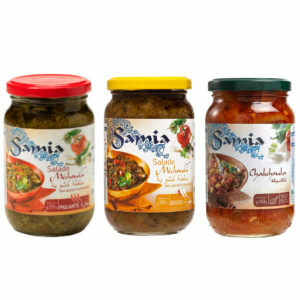 Discover Samia’s olives, selected from the best regions of Morocco. 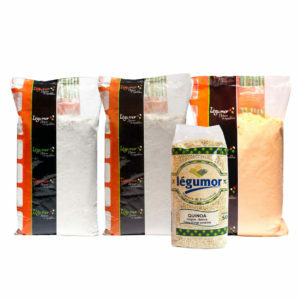 Corn semolina, extra-thin baker quality : this semolina is often used by bakery professional. It was specially conceived to make your dough softer, to facilitate its handling and increase your production. 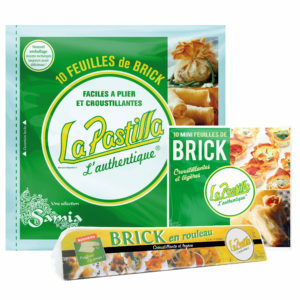 It is adapted to any type of bakery application : breads, cakes, pastries, etc. 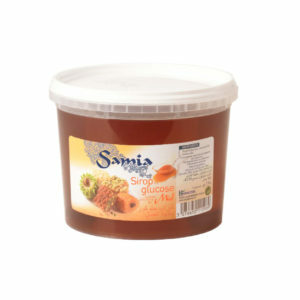 Flavor honey, the glucose syrup is a substitute from honey and is used in oriental pastries’ preparation. 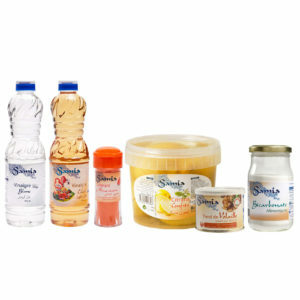 Its fluid texture helps its utilization. 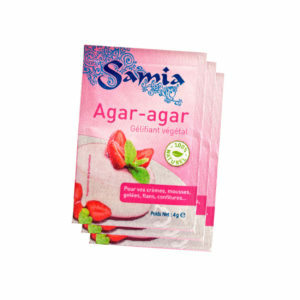 Made from red algae, agar-agar is a natural gallant, 100% herbal. Odorless and colorless, it’s the perfect substitute to animal gelatin. 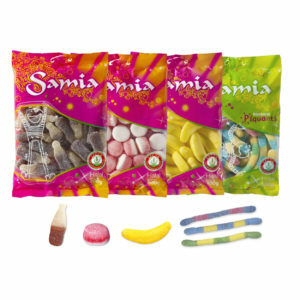 A traditional candy consumed by the whole Mediterranean population. 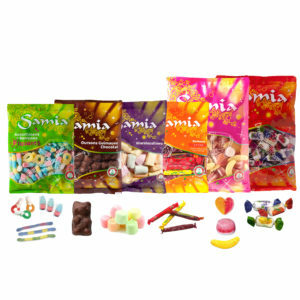 Made from beef gelatin, our candies are certified halal by the Great Mosque of Paris. Food coloring, easy to use 33g : to bring color in your meals. 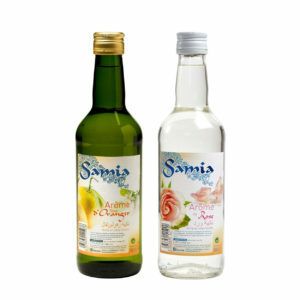 Colored vinegar – halal 0.5 L : traditional format. 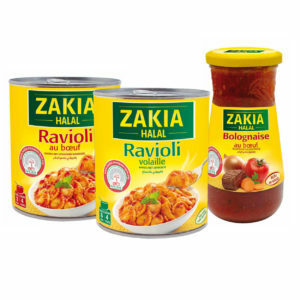 Colored vinegar – halal 0.5 L: manufactured in Morocco, this vinegar is specially liked thanks to its taste and its halal warranty. Recipe totally identical to the traditional bottle. White vinegar – halal 0.5 L.
Vegetable mix 820g : the vegetable mix (cabbage, carrot, pepper, pickle, onion) is the perfect side for cold meats. It is also used as a snack. 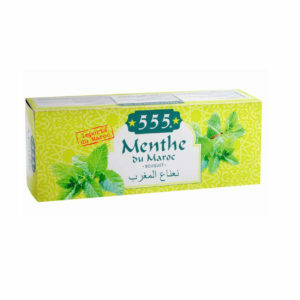 Lemon confit 820g : essential ingredients in oriental cuisine especially to cook tagine, meat, fish, pastas, bulgur and salads. Dehydrated and tasty soups. Easy to prepare, they are ready in 10 minutes. Contains the equivalent of 4 bowls. 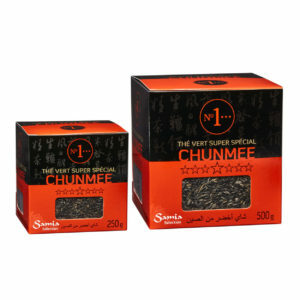 Harira soup 110g : traditional soup from Maghreb made from chickpeas, lentils, onions an vermicelli. 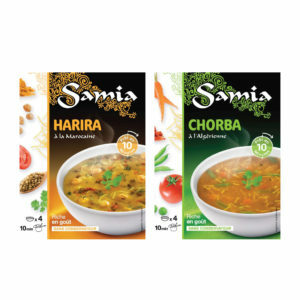 Chorba soup 110g : traditional soup from Maghreb made from vegetables and spices. 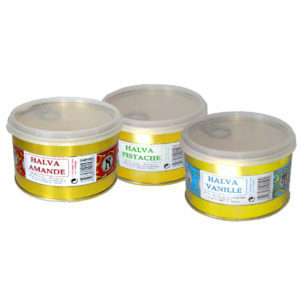 Butter ghee La vache de Paris 400g and 800g : obtained from the concentration of milk fat from the cow. Doesn’t burn during the cooking process. 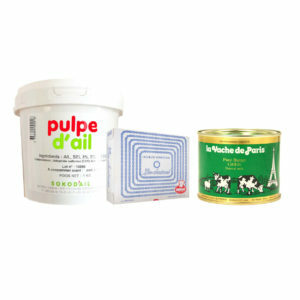 Food coloring Les Chaines 25g. 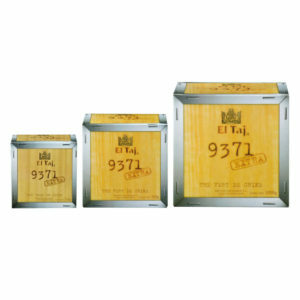 Packaging: 70, 175, 440 and 880g. 3 recipes rich in savory that will allow you to easily prepare a delicious meal. 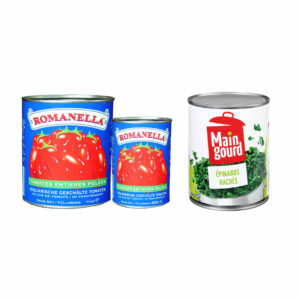 Peeled tomato Romanella. 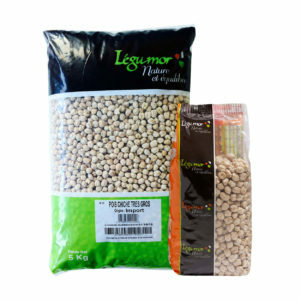 Packaging: 400 and 800g. Chopped spinach Maingourd. 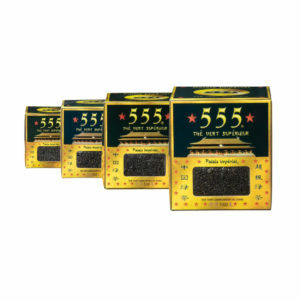 Packaging: 800g. 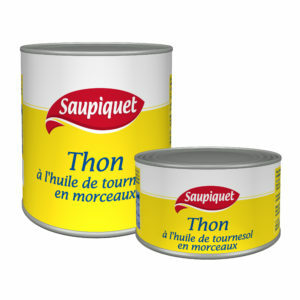 Saupiquet owes a truly knowhow in the selection and preparation of tuna and ensures you a soft and tender product.